1. A 0.2-kg ball will be inserted into hole C, as shown in the figure below. Hitter strikes the ball in 0.01 second and the path of B-C traveled in 1 second. Determine the magnitude of the force so the ball can be inserted into hole C. Acceleration due to gravity is 10 m/s2. Equation of the change in momentum : Δp = m (vt – vo). Since the ball is hit until the ball reaches the point B = part 1 of the projectile motion. The ball travels from point B to C = part 2 of the projectile motion. The projectile motion could be understood by analyzing the horizontal and vertical component of the motion separately. The x motion occurs at a constant velocity and the y motion occurs at a constant acceleration of gravity. x and t are known so that vox can calculated using the equation of the uniform linear motion. vox is the horizontal component of initial speed of ball. 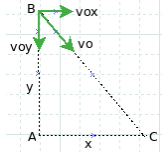 vox = x / t = 5 meters / 1 second = 5 m/s. The horizontal component of speed, vox is always same so vox in part 1 of the projectile motion = vox in part 2 of the projectile motion = 5 m/s. vox and θ are known so the initial speed (vo) can be calculated. The initial speed (vo) is 10 m/s. The initial speed of the ball (vo) in projectile motion = the final speed of the ball (vt) in the equation of impulse-momentum.